A jumpsuit that seeks to elevate the human form into a celestial sensing body. See this video interview by the Verge. Reporter Lizzie Plaugic tries on the jumpsuit and gives her initial impressions. 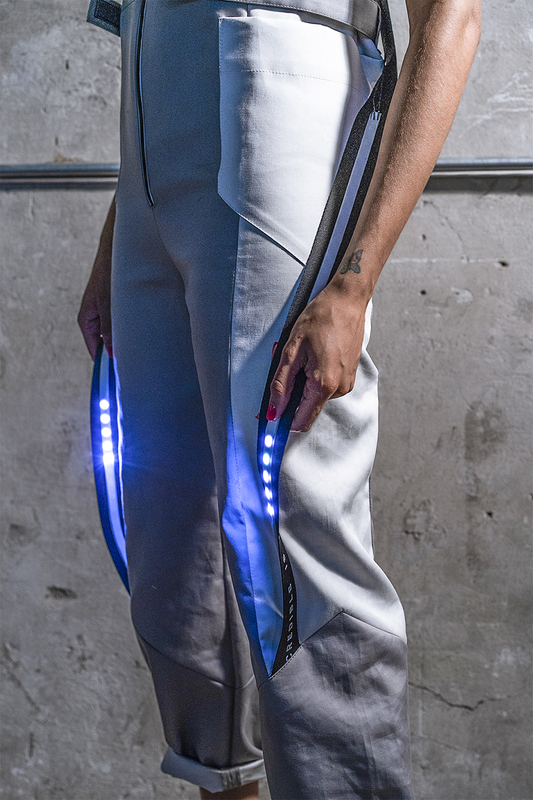 Ceres is a wearable garment that seeks to aid our understanding of near-Earth asteroids in effect, turning the human form into a celestial sensing body. The garment emits electrical current throughout the sensor points in the textile, intimately vibrating against our skin, letting our body sense the range, frequency and distance of NEAs. Ceres also illuminates alongside the garment, identifying the frequency and distance through the velocity and brightness of the embedded LEDs. The embedded microcontroller in Ceres is programmed to work with NASA’s Asteroid Neo-Ws RESTful API, which collects and catalogs real time data sets of near-Earth asteroids surrounding our orbit. This API is maintained by SpaceRocks Team: David Greenfield, Arezu Sarvestani, Jason English and Peter Baunach. The original concept for Ceres is inspired by NASA’s mission and research in mining potential valuable resources from asteroids. Asteroids holds a vast amount of resources that can potentially one day offer a new source of materials, as they become more scarce on earth. In the article, New NASA Mission to Help Us Learn How to Mine Asteroids, by William Steigerwald, NASA’s Goddard Space Flight Center, Greenbelt, Md., he describes, “Asteroids could one day be a vast new source of scarce material if the financial and technological obstacles can be overcome. Asteroids are lumps of metals, rock and dust, sometimes laced with ices and tar, which are the cosmic "leftovers" from the solar system's formation about 4.5 billion years ago. There are hundreds of thousands of them, ranging in size from a few yards to hundreds of miles across. Small asteroids are much more numerous than large ones, but even a little, house-sized asteroid should contain metals possibly worth millions of dollars.” For more information about this article, please click here. Global hackathon events to help innovate in asteroid mining, has been taking place under NASA’s Space Apps Challenge, which one of our co-founders has participated in the past, and which seeded the idea to create a garment that can sense asteroids. Ceres is an exploration in elevating our relationship with the cosmos, but also a speculative design piece exploring the potentials in what we could wear in the near future for aiding in asteroid mining activities. Beginning Footage Credit: Christopher Arcella http://www.christopherarcella.com/ .